MATcutter.com has BLACK CORE MATS IN STOCK! BLACK BEVEL AROUND WINDOW! Get the black core look in acid neutral, standard core. Sharp contrast of black on white or the great look of black on black core. Add drama to your image. Click on image to select mat sizes and colors. Whether you want to cut your own custom windows or just want to float your image on a mat, these blank or "mats without windows" are an economical way to accomplish that. Our standard, 4 ply back core mat, approximately .050 thick and buffered with calcium carbonate. 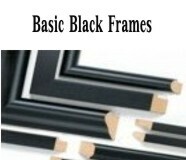 Available Black or Bright White face color on black core.